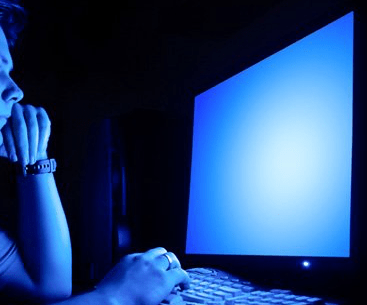 Do you suffer from eye strain, eye pain and headaches from your screen? Have you ever wondered why the sky is blue? Well, not all light is equal. Some light – on the red end of the spectrum – omits low energy. Some light – on the blue end of the spectrum – omits high energy. This means that the light in the sky is dominated by blue as it travels more powerfully. We spend a lot of our day staring into blue light. The light that comes from our mobile devices and laptops is blue light. Add fluorescent lights and LED televisions to the technology and our exposure to this potentially harmful light could be excessive. The bottom line is that the amount of blue light in our life is putting a massive strain on our eyes. However, the blue light given off from our smart phones and tablets is a fraction of that given from the sun on a clear blue-sky day. Imagine the impact of sunlight from snow on the eyes – that can cause blindness. Yet, UV radiation barely makes its way into the eye and only 1% hits the retina. However, virtually all blue light from screens reaches the retina. This leads to concern about macular degeneration, which can lead to permanent vision loss. Eye diseases are likely to be the extreme consequences. In reality, we are likely to struggle with digital eye strain and computer headache syndrome at worse. This is caused by the extra effort it takes to focus on blue light – which scatters more easily than other light. If you are a gamer, blogger, online surfer or writer, then you spend more time than most on your devices – and there is little you would want to do to change this. So, banning all exposure to blue light is never going to happen. Our lives are organised around our devices. It is also worth pointing out that blue light is linked to elevation of mood and a reduction in the impact of seasonal depression – so banning it is unhealthy. There is the option of blue light filter glasses, which have yellow tinted lenses. These do not look cool but are effective against the itchy eyes, the blurred vision, the bloodshot eyes. Yet, we might have another solution, a natural blue light filter, made completely from plant-based natural products. It helps not only with blue light but UV radiation and infra-red radiation. We would like to introduce you to CAPS SUN – a marigold extract with some other magical ingredients. Natural products using marigold have been in existence for almost a thousand years. It has been made into ointments, teas, tinctures and creams. Not only does the marigold repel bugs in the garden (and from the skin too, by the way), it is also an anti-inflammatory, antispasmodic and antifungal compound. Add to this one important function for us blue light lovers – it acts like a blue light filter and protects the eyes. The marigold acts like a natural body guard for the delicate tissues of the eyes that can deteriorate because of UV and blue light. It reduces the impact of oxidative damage, which reduces deterioration in eye health. There are two other ingredients in CAPS SUN that impact of UV damage. There is Haematococcus pluvials alga. This is a proven anti-inflammatory and antioxidant – as it stimulates the production of the carotenoid astaxanthin. As well as being great photo-protection – the protection from the energy created by light – it is also used in cosmetics because of its wonderful impact on the skin. Then, there is golden polypody. This is a plant that grows in the wilds of South Florida. This also works by preventing the oxidative damage caused by UV light entering the eye. It is also pretty good at cleaning the blood apparently. We are used to the setting sun being compared to a blood orange and this is the impact of the red-light waves travelling further than there more powerful blue waves that also dissipate quicker as the sun sets. However, the extract from the red orange is also effective in countering the impacts of UV damage. It protects against the impact of solar radiation and oxidative stress on the skin. It also has the wonderful side effect of promoting an even tan – so has some cosmetic use too. However, its miracle impact is countering the ageing effects of the sun. It boosts the antioxidants in our bodies that do not work as effectively when exposed to sun. Blood orange therefore offers some miracle photo-protective effects for sun-lovers, as well as screen-lovers. UV and blue light can impact on the health of the eyes – and of the skin. Therefore, CAPS – SUN with its mix of marigold, Haematococcus pluvials alga, golden polypody, and blood orange – can help to filter dangerous light and prevent potential damage to the retina and to aid the skin at the same time. Therefore, we do not have to completely abandon the sun, and nor do we need to leave our devices behind. We can choose to use them in moderation– at the same time using a plant-based supplement to counteract any potential impact. In all seriousness, we need a solution to the sore eyes and blurred vision that can occur because of too long staring into a screen. CAPS-SUN offers great eye nutrition and comes from a company recognised in the European Business Awards in 2017 for winning in the category covering innovation, business ethics and business success. This new digital vision or digital eyes, as it has become known, may end up being a serious problem as we enter our older age. We have yet to see the potential increase in vision loss that comes from our increased exposure to blue light. It makes sense to take advantage of nature to protect our eyes – and skin, and breathing, and cells from cancer – from potential blue light damage. PC monitors, smartphones and tablets.